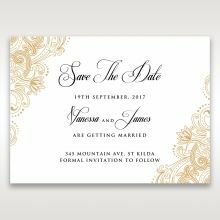 This customisable invitation is the perfect choice for brides who adore decadence and glamour. An ornate pattern has been delicately cut into the outer pocket which has been crafted out of an iridescent gold paper stock. The inner card is completely customisable with colours, patterns and text so you can recreate you and your partners love story. Please note: Luxurious gold lined envelopes are complementary with this design. I ordered these beautiful invites for our Engagement Party as I fell in love with the amazing presentation of them! The ordering process was super straight forward and the customer service was phenomenal! These invites definitely have a 'wow' factor, and set the perfect tone for our engagement, people are still commenting and telling me how amazing the invites looked! 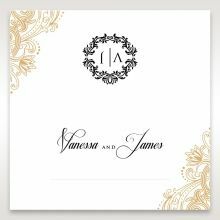 I highly recommend these beautifully luxe invites and wish that I could of ordered these for our wedding as they are so unique but are amazing quality!!!! The best by far! Beautiful cards, they look really elegant and classy, great quality and design. I ordered some samples and they arrived really fast and the presentation was really good. Even the envelopes have a great touch of good design. I will be using them for my wedding. This company really gives attention to detail. Every single sample I ordered was really nice, all of them looks really professional. I Highly recommend this site. We purchased the Imperial Glamour - Pearl card for our wedding invites. The card itself was absolutely perfect, the printing was exactly as we had requested and beautifully completed. 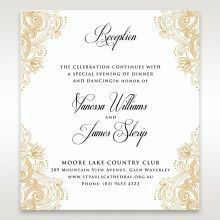 The gold jacket was a touch of elegance and combined, the invitation was even better than the templates we viewed online. 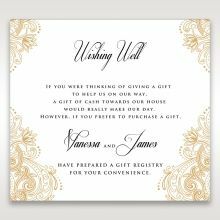 The printing of the names and addresses on the envelopes were a perfect addition and made our lives a lot easier. The team did a great job ensuring all the small details were ironed out prior to printing as well. Collecting the cards was simple and the people at the store were lovely and helpful. Thank you so much! This invite is absolutely gorgeous! I loved it the moment i received it. 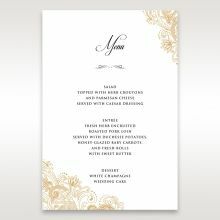 I would love to use it for my wedding...its got so much character to the foil, the writing and presentation. I even loved how professional the envelope and all the work was!! Highly recommend this invite. 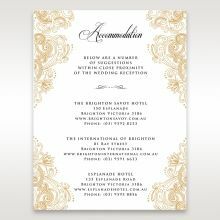 Its so hard to choose from this website because there are so many gorgeous invites and the prices are unbeatable! I can't wait to order! I recently purchased these invitations for my engagement party.I know they aren't exactly cheap but they are quite nice quality, good details in the invitations, they are very beautiful just like in the photos. Packaged well too with bubble wrap etc.Happy with my choices and have had good feedback from relatives. Will definitely purchase again from Giant Invitations in future. Thanks for your communication and help as well. 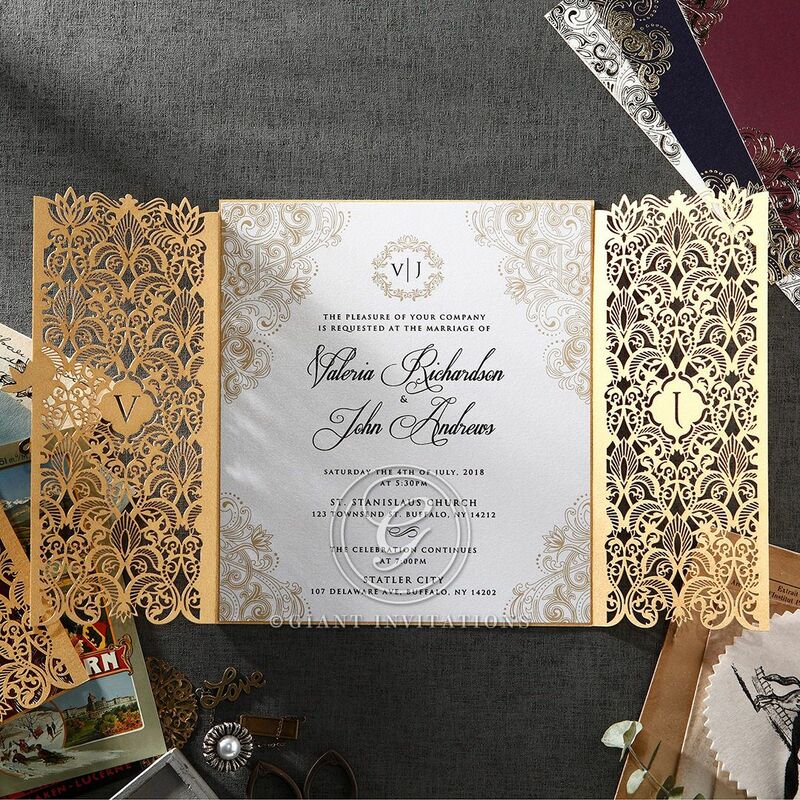 Stunning invites that have very intricate designs with quality paper. The font is fantastic and samples came through quite quick. This is definitely a number one contender in all invites. There could be some more concepts on wording for reception vs wedding. The overall cost seem ok. A bit pricey but if all invites come back like the samples then we will be quite happy with the order. Will write another review once ordered. Opulence at it's best. 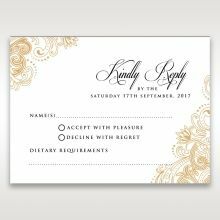 My fiance and I were getting married in a castle and searched the kingdom far and wide for invitations that screamed opulent, but elegant that also came in rich and regal tones, when we found these invitations by Giant we knew we had to have them. Also the customer service at Giant has been kind and impeccable, every question answered and no stone unturned to ensure satisfaction. Just WOW!!! I ordered these invitations for our upcoming wedding in Fiji. I wanted something elegant and original and I was not disappointed. The invitations are absolutely stunning. From the moment you glimpse your initials on the golden outer pocket to the beautiful artwork enclosed, you can't help but fall in love with this luxurious design. Highly recommended - you won't be disappointed. Beautiful craftmanship and quality paper - Not surprised as to why it is the premium wedding invitations range! Can't wait to have all out guests talking about our beautiful invites. 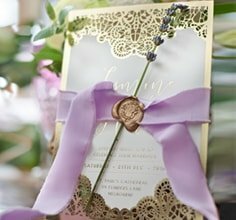 Invitations are so beautiful and elegant! The samples I received are exactly as displayed on their website. I was also super surprised at the quality of the complimentary envelopes. Most complimenatry envelopes tend to be thin and the type that tear easily. 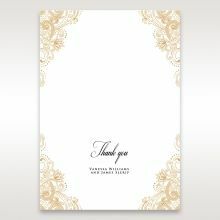 Website is super easy to use and the staff are extremely friendly and have been amazing with answering all my questions.I would highly recommend people to order their invites with this company.The only negative thing would be that RSVP and place cards are quite pricey. But I guess their prices do reflect the quality. I ordered some samples from Giant Invitations and all were beautiful, but there stood out more than the rest! Everything was so beautifully done with great attention to detail. My fiance and I love it so much that we will be planning the decor of our entire wedding (cake design, dance floor, etc) around the design of these invitations! 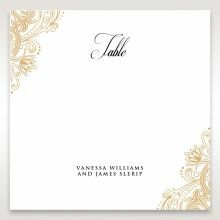 We will be ordering the matching table numbers and place cards in this design as well! Easiest website to use with the most creative invitation designs as well as a large selection of editing options. Have been Looking through many sites to find the perfect design for my engagement. This was by far the best site. So much easier than going into a store...cheaper too! 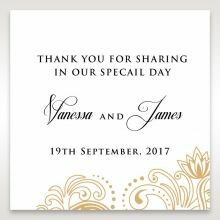 !Will highly recommend to anybody looking for a quick and easy solution for amazing invitation designs with a unique touch. Will definitely use again.